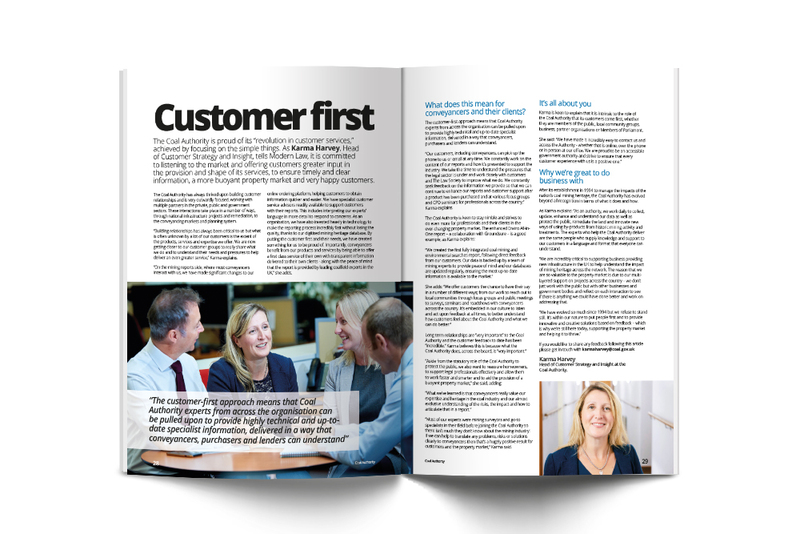 Karma Harvey, Head of Customer Strategy, speaks to Modern Law to explain how the Coal Authority has gone through a revolution in customer services. As newly awarded members of the institute of Customer Services, Karma explained how as an organisation “we are very outwardly focused, working with multiple partners in the private, public and government sectors. “Building relationships has always been critical to us but what is often unknown by a lot of our customers is the extent of the products, services and expertise that we offer. We are now getting closer to our customer groups to really share what we do and to understand their needs and pressures to help deliver an even greater service. “Our customer-first approach benefits from our in house Coal Authority experts. We can pull this knowledge from across the organisation to provide highly technical and up to date specialist information, delivered in a way that conveyancers, purchasers and lenders can understand.